Understand your pus leaking from the ear symptoms, including 6 causes and common questions. The ear is a body part not only responsible for hearing but also activities such as balance and proprioception (the medical term used to describe your body’s ability to sense its orientation in relation to the environment). Middle ear: This consists of three small bones that connect and transmit sound waves from the outside world to the inner ear. Other structures: The ear is also composed of a tympanic membrane (eardrum) that divides the outer ear from the middle ear, and a Eustachian tube. 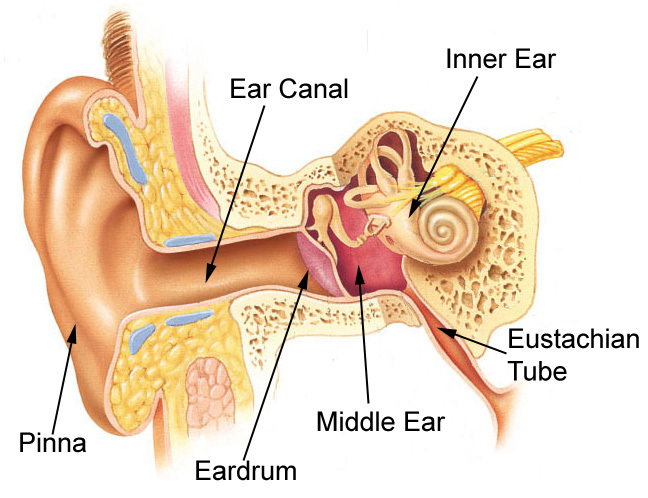 The Eustachian tube is a structure that links the middle ear to the nose and helps equalize pressure in the middle ear. See this image for a visual representation of the outer, middle and inner parts of the ear and its different components. The hollowness of the ear makes it susceptible to foreign materials and infection. Pus leaking from the ear is a telltale sign on infection. If you are experiencing pus leaking from the ear, make an appointment with your doctor promptly. Pus leaking from the ear can be the result of many disease processes and can have many different appearances. It is ultimately the result of the body’s immune system reacting to infection. Neutrophils, a type of white blood cell in charge of attacking harmful pathogens, accumulate in affected areas and lead to the presence of pus. Thick, white-yellow, yellow, yellow-brown: This is due to the accumulation of dead neutrophils. Green: This is due to the presence of an antibacterial protein produced by some types of white blood cells called myeloperoxidase. Green and foul-smelling: This is due to bacteria that produce a greenish pigment called pyocyanin . As discussed above, pus is the result of the body responding to infection. Infection of the ear resulting in drainage of pus can occur in many different ways. Infection of the inner ear components is known as otitis media and infection of the outer ear is known as otitis externa. Fungal: Otomycosis is a fungal infection of the external ear, middle ear and open mastoid cavity . Fungi such as candida and aspergillus have a predilection for the ear and also often infect people with weakened immune systems. Environmental: External factors such as swimming and heavy perspiration put moisture directly into the ear canal. Repeated exposure can result in bacterial growth and future infection that leads to fluid accumulation within the ear. Earwax is a natural component of the ear that works to protect, clean and lubricate the ear; however, it can also accumulate and cause similar symptoms. Structural: Some people have narrow ear canals that make drainage of moisture more difficult. This structural anomaly causes a blockage that traps water and promotes bacterial growth and infection that results in swelling. Devices: Items that you put directly into your ear such as headphones or hearing aids can also cause a blockage that traps excess water and results in otitis externa. Tumors: Benign and malignant tumors can block the ear and lead to wax build-up, which can cause recurrent attacks of otitis externa . Ear cleaning habits: Using ear swabs to clean the ear of earwax or debris may contribute to pathogenesis due to direct injury to the skin barrier of the ear. Furthermore, ear swabs can perforate the eardrum if placed too far into the canal and cause many negative symptoms including infection. Iatrogenic (medical related): Procedures or operations to the ear can predispose an individual to the development of infection by altering the anatomy and local environment of the ear canal and producing changes in earwax production or humidity, favoring fungal growth . Individuals with weakened immune systems due to genetic, acquired or systemic conditions are very susceptible to infection by a wide array of pathogens. In such individuals, the ears are not spared, and pus leakage due to infection is a very common occurrence. The list below shows results from the use of our quiz by Buoy users who experienced pus leaking from the ear. This list does not constitute medical advice and may not accurately represent what you have. At the onset of symptoms, it is important to seek prompt medical attention and get your doctor’s advice before trying things for yourself at home. Moreover, at-home treatment for most causes of pus leaking from the ear self-resolve and involve supportive measures such as rest and hydration. Your healthcare professional will treat the pus accumulation by stopping the infection and allowing the ear to heal. Eardrops: Your doctor will prescribe eardrops with a combination of ingredients that fight bacteria and fungi as well as reduce inflammation and help restore your ear’s normal pH balance. In order to prevent ear infection, there are many things you can do at home and change in your normal routine. Keep your ears dry: Thoroughly dry your ears after exposure to moisture from swimming or bathing. Practice techniques such as tipping the head to the side to help water drain from the ear canal, and wipe the outer ear slowly and gently with a towel. Do not put foreign objects in your ear: Do not attempt to scratch or dig out earwax with objects such as cotton swabs or paper clips . These items may not only irritate or break the skin in your ear but can also pack the material deeper into your ear canal, worsening blockage and moisture buildup. If you notice that your ear infection has spread, either to other parts of the skin or base of the skull, seek medical attention immediately. This is a condition known as necrotizing otitis externa and requires urgent systemic antibiotics to control the spread of the infection . Will I regain my hearing after my ear infection? Hearing loss in the setting of an ear infection can be a scary and concerning symptom. Fortunately, the hearing loss is not the result of damage or injury to the ear but rather a temporary obstruction of the middle ear that prevents sound waves from reaching the inner ear/brain. In most situations, once the fluid accumulation resolves, hearing is restored. Ear infections occur most often in young children who usually do not have the capacity to properly communicate their symptoms. However, there are many signs you can look for that may indicate your child has an ear infection. These signs include your child is pulling or tugging at their ears, are increasingly irritable (having trouble sleeping, are crying more or are fussy), they have a fever, they have drainage coming from their ear, or they have problems with balance or clumsiness [6,7]. Earwax is good is small amounts. It is the ear’s natural protectant and important for preventing bacterial and fungal infection. However, too much earwax can cause blockage and predispose the ear to infections and other problems. It is important to regularly clean the ears with either saline or hydrogen peroxide on cotton balls or via a bulb syringe. Why shouldn’t I use cotton swabs? You may think that cotton swabs can help clean out the ears; however, they usually end up pushing wax and debris deeper into the ear canal. Cotton swabs are also dangerous because they can irritate the skin and even perforate the eardrum if pushed too far. Why is the pus leaking out of my ear green and foul-smelling? If the pus from your ear looks green or foul-smelling, you may have an ear infection caused by a bacterium called Pseudomonas aeuroginosa. Pseudomonas produces a green pigment called pyocyanin and infections by this bacterium are particularly foul-smelling.